Podcasting has been moving at the speed of light as of late; not only do I have #10 ready, but I also have recorded and finished #11, and #12 is just awaiting editing. Funny what happens when you don’t have work every morning. Haha. A little bit about #10. First of all: how awesome is it that I’ve hit double digits? I’m excited. Ten is also a chapter that, if you follow along ’round these parts, I’ve had some issues with. I won’t really go into it, but it’s been a lesson in letting go. Because, honestly, sometimes you have to just let the story fly, understand that things may change a little (in this case, pacing more than anything), and recognize that, in the end, you can’t be perfect. I’m far from perfect. Ten is still one of my favorite chapters, however, due to a meetup between two characters that, until this point, haven’t met. I remember writing this for the first time, and literally giggling as I did it. Crossing wires like that can be so fun. It occurs to me that during yesterday’s very early morning post (this was before I even started work, people!) I missed out on a really fantastic comparison. How could this be? Me, the writer? Missing a simile!? Well, I should say, duh. Yesterday during my Runes class (yes, I take a class on ancient Runes… and yes, that is super awesome) and we were talking about Regin and Sigurd, and how the sword Regin smithed was indeed the best EVAR, but it also took him three times to get it perfect (and good enough to slay a dragon, no less!). 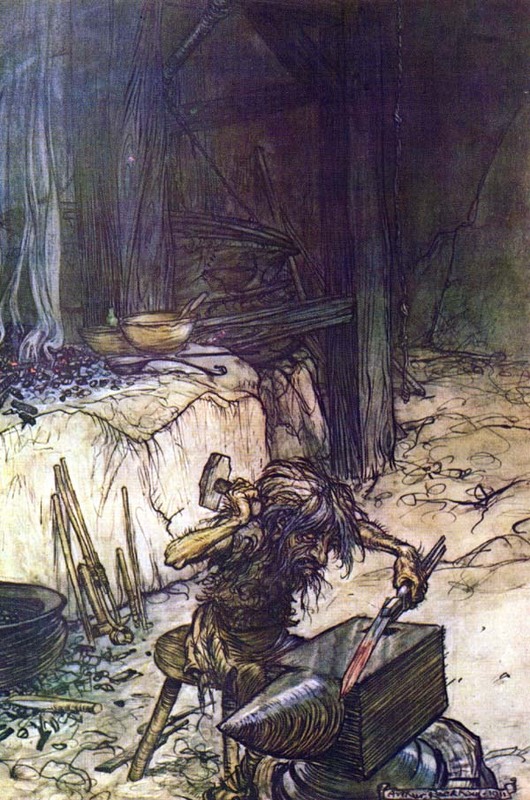 So I realized, then, that gosh–the parallels in writing a novel and smithing are incredible. Yes, I’ve written novels before. And yes, they’re far from perfect. They would indeed “shatter” if used. But taking the time to edit, that’s like tempering the metal, refining it, making sure that it holds up. And yes, it’s a lot of blood, sweat, and tears. It’s physically and mentally exhausting. But in the end, the final product will be that much more durable, because I took the time to do it. I suppose in a way, I have my own characters to thank for this insight, as obvious as it might have been. Brick and Cora appeared to me in a flash of clarity almost a year ago to the date, their faces as vivid as if I’d seen them across the room. And since then, they’ve taken me on quite a surprising journey. I’ve learned more writing The Aldersgate than any other work to date, and not just about the story, either. Working on The Aldersgate has given me new insight into myself, my soul, my work; I feel like I know myself better having gone through the process. So maybe it’s not just the sword that gets tempered, but the smith, too. I’ve been working on putting some new bits and pieces on this site. As I mention in my Author page, I do lots of other things besides write. One of my favorite past-times has always been drawing. Tinkerer that I am, I can’t help but put together some sketches of my characters; this being a multi-POV novel, it also helps me (and any potential readers) keep track of who’s who, as well. You can read about Cora Grey, our heroine of sorts, under the Cast tab, and see what she looks like in my mind’s eye.